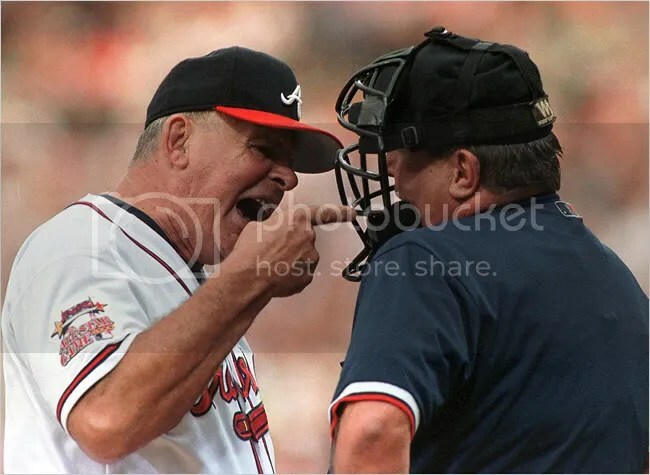 I’m really sick of people complaining about Bobby Cox. Seriously! When is it going to stop? If anyone of you whiners knew anything about baseball, you would know that deciding when to take out a pitcher and when to leave him in is the hardest thing for a manager. They stress about this all the time, its what keeps Pinella, LaRussa, Cox, Torre, etc. up all night. Furthermore, I believe its wrong for people to critic (although thats putting it lightly, you people are b*tching) something, if they can not to better themselves. Bobby’s uniqueness entails building up players’ confidence. Do you think taking a pitcher out as soon as he gets in a jam is going to bode well in the long run? No. That player is going to get pissed. You also CAN NOT overuse an already tired bullpen by taking out a pitcher to early. Managers judge whether to let a pitcher get through a jam based on how good his pitches are, not the result of his pitches. If 4 men in a row get 4 cheap singles in the 2 inning, are you going to take him out? Well, you should say no. If you want to root for a manager that is the anti-Bobby, then become a White Soxs fan and stop making Braves fans look stupid. I would also like to add that I really like the White Soxs and have nothing against them expect for Ozzie Guillen.